Sorry I haven't been on to update. Abby is ill. We are going on a little over a week now. Croup quickly turned into Pneumonia and asthma. The docs dropped that little bomb on us Wednesday. I was so shocked I just kept saying OK instead of drilling them with what an asthma diagnosis means. I'm hoping it is just something that comes with Pneumonia and that she's not going to have all the time asthma if that makes any since. I am exhausted and will update when I can. I thought about posting a pic then thought that as a 7 year old little girl she probably wouldn't want me posting pics of her other than smiley or happy,dressed up or playing unless is was Rett Syndrome specific so there will be no pics until she is well. Please keep her in your prayers. This past weekend we took part in the Blue Sky Girls. A symbolic event held in unity around the world at 10 am central time where thousands of girls with Rett Syndrome climbed stairs in their towns symbolizing their plight and unity for equal rights and awareness in honor or Rett Syndrome Awareness Month. Piper. So little,diagnosed early and as beautiful as she can be. Woo Hoo we made it!!!! !Take that Rett Syndrome! Miss Flirty pants is pretty proud and so are we! October is Rett Syndrome Awareness month and just a few days ago Gov Jay Nixon once again in the state of Missouri. We work very hard in this house to keep awareness and the need for funding for our cure alive and want to remind everyone that Rett Syndrome had been reversed in the lab. We only lack the funding to in getting this to our girls. Please keep Abby and all the girls living with this terrible disorder in your thoughts and prayers. This is the blog of should have written when I broke down with my last post. Sorry about that. It happens. The day after I wrote mine I was asked to guest blog on the Autism blog "Seven Yuck Mouths and Autism" by a friend I have met online throught A4CWSN. It just flowed when it was something to educate the general public and not me blubbering here. We decided to also post it on the Blog I help out with for Girl Power 2 Cure. Thank you Lisa for allowing me to spread the world on your wonderful website and Ingrid for allowing me to get personal on RettGirl. It's Rett Syndrome Awareness Month - let's make some noise! It's me, Terri. I am Mom, Rett Mom, Advocate, wife and all around Autism awareness terrorist. I run RettGirl.org and a YouTube channel called Rett We Can for Girl Power2 Cure. Why? Well thank you, I’m so glad you asked. I hope you can pass on this blog and help us spread the word about the hundreds of thousands of girls fighting Rett Syndrome. My 7-year-old daughter Abby has Rett Syndrome - an X Chromosome Linked form of Autism and the only form of Autism with a known genetic cause. Because the gene mutation is on the X Chromosome, it mainly affects girls, but there are a handful of boys that have it too and they are just as deeply affected. The gene of which we speak is called MECP2. It is known as the regulatory gene between your brain and your body. It is the gene that tells every other gene when to turn on and off. Strangely, this gene doesn’t play much of a role until your child is between 18 months and 2 years of age. Up to that point you have a seemingly normal, typical child doing all the things they are supposed to do. Once this gene kicks on, if it is faulty like in Rett Syndrome, everything start s to shut down. There is a rapid period of regression where most every acquired skill is lost. Most purposeful hand use disappears almost immediately and is replaced with a constant wringing, tapping or hand mouthing. All speech goes during this regression stage, and your child turns physically back into an infant where she will stay…trapped in her own body until a cure is found. Good news! Rett Syndrome is poised to be the first curable neurological disorder. It was announced in 2007 that Rett Syndrome had been reversed in laboratory mouse models. It’s there and until we can get it funded in a way that gets it right for humans, our babies remain locked in a world they can only observe. One major debilitating factor in Rett Syndrome is called Apraxia. Apraxia is like this: the will to carry out intent is there, but the physical ability is severely delayed or not there at all. Some describe it as having Autism, Cerebral Palsy and Parkinson’s all rolled up in one little girl. Debilitating neurological (movement) disorder that predominantly affects females. Baby girls are born "normal" but begin to lose acquired skills between the ages of 1-3 years old. Caused by a single gene mutation that leads to underproduction of an important brain protein. The most severe form of autism. The leading genetic cause of severe impairment in girls - most cannot speak, walk or use their hands. Despite their physical disabilities, girls with Rett Syndrome are believed to be functioning mentally at a much higher level than previously thought. As prevalent as Cystic Fibrosis, ALS and Huntington's. Another little girl is born with Rett Syndrome every 90 minutes. Rett Syndrome is a potentially REVERSIBLE disorder. Research has proven once protein levels are back to normal levels, symptoms subside. Why have I never heard of this you may ask? That’s why we are here today. To inform, educate and raise awareness so little girls like my Abby will no longer be held in the unknown. Thank you - PASS IT ON! I hate October. I really do. I have decided at least for this 1st October postt that I'm not going to go over our sob story once again..It's here..in the past..several times and it's about time I accepted my daughter the way she is and stop mourning the what could of been. Wow that was hard to say. 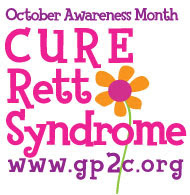 With October comes Rett Syndrome Awareness Month and the push for education,equal rights and awareness. Somewhere,sometime, I will have to tell the story. I hate it and just don't want to anymore. I have got to make this positive somehow or I will never be ale to move on. What stinks is D day is in October. Diagnosis day. You remember it on that day like the ...well like the day someone died. May sound terrible and we don't all day it out loud but that's it. The day our dreams and our livees died and we had to pull ourselves from the rubble, This October marks 5 years. You would think at some point one would be able to move on without posting a blog about how much she needs to move on while gasping for breath and choking on her own tears. This year I will be happy. I will not lay in bed on the 26th. One day I wont even notice it'ss the 26th. I kinda screwed the pooch on the I will survive post here.